Our nine-room backpacker facility has three main room types and we also offer campervan parking with electrical connections for four vehicles. Each room has its own heat pump for climate control. These two rooms consist of a single bunk over a double bunk. 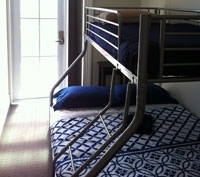 Three rooms consist of two sets of single bunks accommodating four people in each room, while a fourth room has three sets of bunks accommodating six people. Three rooms suited for couples with a queen-size bed and hand basin.